Mars, observations from 2014 and 2016 - wa2guf's JimdoPage! April 24, 2016. 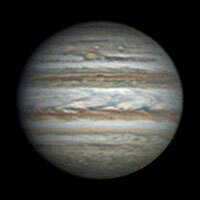 Seeing was a bit better than predicted towards the end of my imaging session which lasted from about 2:50 til 3:45 AM. I am guessing about 4/10 early on and 6/10 by the end. I took 13 videos of Mars of two minutes duration between 3:04 and 3:40 AM and processed them with Autostkkert2, Regista6 and finally WinJUPOS to give the final image shown above. 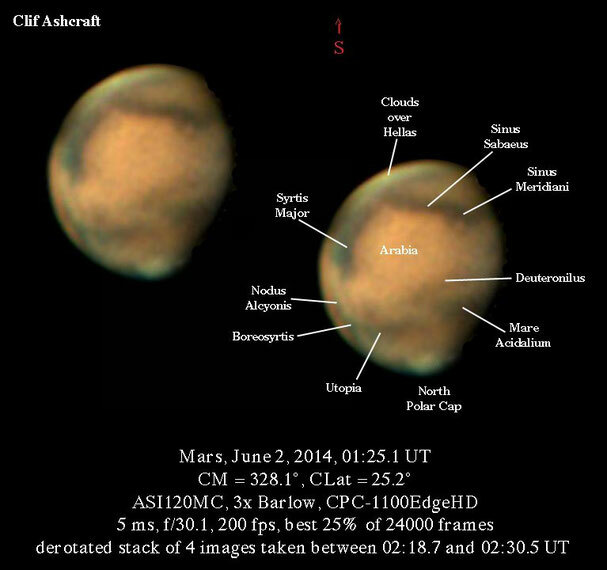 I used my atmospheric dispersion compensator (see Saturn, current" webpage for construction) to minimize atmospheric chromatic blur which is quite prominent at the low altitude of Mars this opposition. 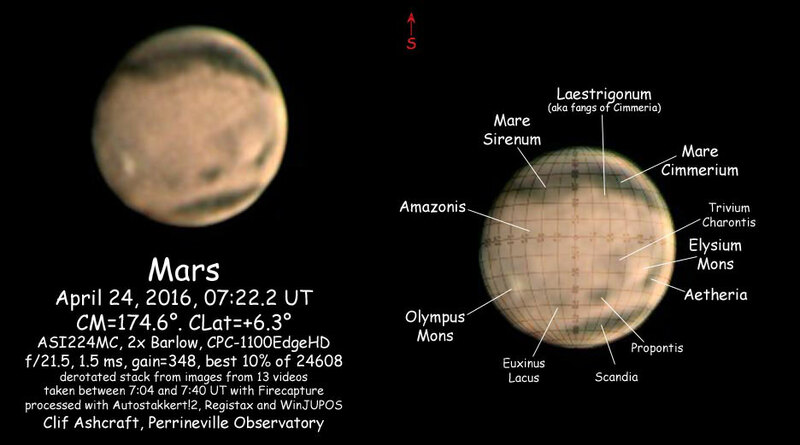 Many features were visible, including Olympus Mons in relief. The western (right) slope of the volcano is lit up by the setting sun and the eastern slope is in shadow. Elysium is also prominent. The annotated image on the right has a dimmed overlay of the BAA graticule for CLat=+6 degrees. From the CM=174.6 degrees you can locate features using the ten degree latitude/longitude grid this overlay provides. There is an interesting linear feature, roughly parallel with the border of the dark albedo features Mare Sirenum and Mare Cimmerium and approximately 10 degrees to the north. It does not appear in any of the albedo maps I have seen but roughly follows the continental slope between the northern abyssal plain and the higher regions of Terra Cimmeria and Terra Sirenum, ie, beachfront property. 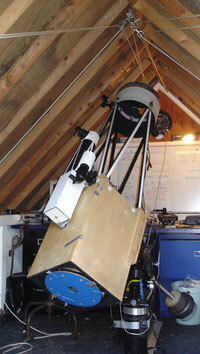 Last night I used the image centering and autoguiding features of Firecapture for the first time. Worked very well with the ASCOM drivers for my Celestron mount and kept the image of Mars very nicely centered in the 268 x 293 pixel ROI. Combined with the automatic sequencer in Firecapture, it appears that I could easily have the program take a sequence of several dozen videos sequentially with programmed time spaces between them. Good program! April 18, 2016. Seeing was below average when the video for this image was taken, however, some features are visible including clouds over Elysium. April 6, 2016. Seeing was above average this morning when the data for the above image was taken using the ASI224MC, 2x Barlow on the nosepiece of my atmospheric dispersion compensator, and the CPC-1100EdgeHD. A 120 second video with exposure of 1 ms, gain 402 and a histogram 65% was processed in Autostakkert2 keeping the best 25% frames and sharpened in Registax 6. The central meridian is 0.7° and Sinus Meridiani is very close to the center of the image. A couple of Uncle Percy's infamous canals are visible. Deuteronilus is seen coming up diagonally from the dark albedo feature Ismenius Lacus at about 7 o-clock near the lower limb. The north polar cap is small and the Chasma Boreale is prominent. November 25, 2015. 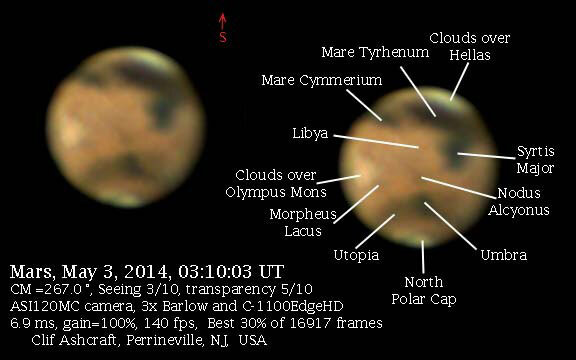 In contrast to the great image from a couple of years ago below, here is an early image of Mars for the 2016 opposition. It was only 4.64 arc seconds in diameter and 186 million miles away, but already some features are visible. 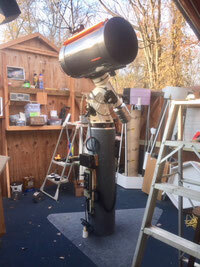 Tomorrow morning, with a little luck, I will try my new 16" Newtonian. Wish me luck! June 3, 2014. Seeing was predicted to be above average tonight. It was unusually good for my part of NJ, but probably only 5/10. Still, it was nice to be able to focus the image. I attached the ZWOptical ASI120MC to the CPC-1100EdgeHD with a 3x Barlow. This combination gives f/30.1 Running Firecapture 2.3, I took 9 raw 8-bit videos of 120 seconds duration with a shutter value of 7.35 ms and about 135 fps. This gave me a histogram about 60% full and resulted in a bit over 16,000 frames per video. 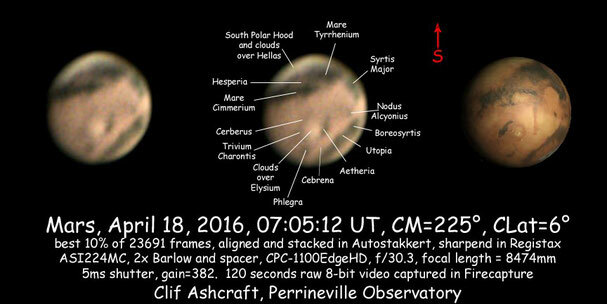 While taking the video, Syrtis Major, Sinus Sabaeus and the tiny North Polar Cap were easily visible on the computer screen, jiggling about and moving in and out of focus with the seeing. I processed the videos in AutoStakkert2, stacking only the 15% best frames. The resulting stacks were sharpened with Registax6, derotated and stacked in WinJUPOS, and finally sharpened again to give the image above. Many identifiable details are present including the Lowellian "canal" Deuteronilus, and are labeled in the diagram below. June 2, 2014 Clear skies tonight with a prediction of above average seeing. 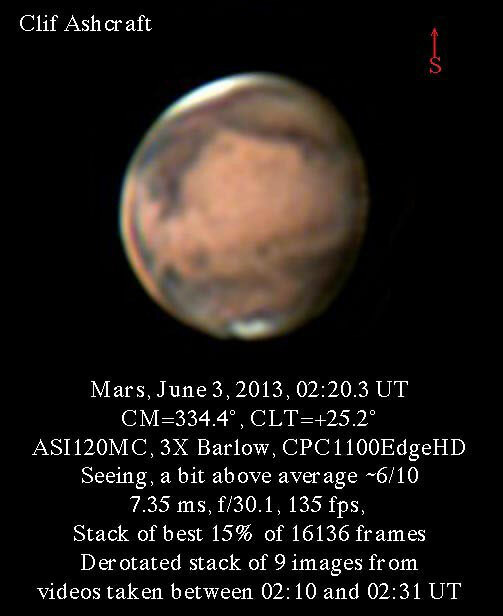 Set up C-11 on Mars with the ASI120MC camera attached with a 3x Barlow. This gives f/30.1. Seeing was not quite up to predictions, average at best. Transparency good. Was able to use 5 ms exposure at full gain giving a 50% full histogram. I took four 120 second raw 8 bit videos between 02:18.7 and 02:30.5 UT and processed them with AS!2, stacking the best 25% of 24,000 frames, derotated with WinJUPOS and finally sharpened in Registax6. 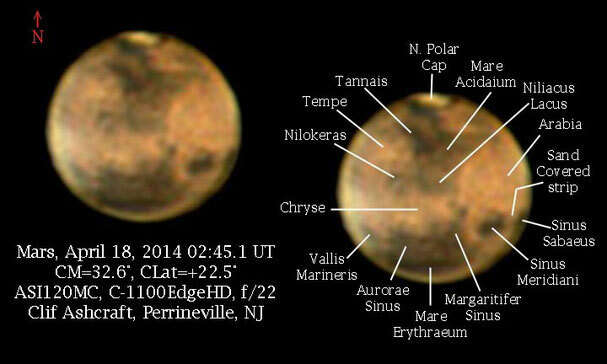 Mars was 11.7" diameter, magnitude -0.48. The image shows mamy recognizable features which are indicated in the image above. Hellas has been cloud covered the whole opposition. May 3, 2014. After I got home from the AAI meeting, the sky was still partily clear and I opened up Observatory #1 and set the C-11 on Mars. 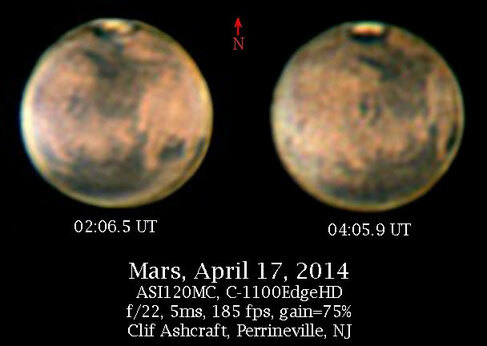 Seeing was below average with Mars rapidly distorting like a balloon being squeezed. I guess about 2-3/10 seeing. At least I could see it and it was not raining... 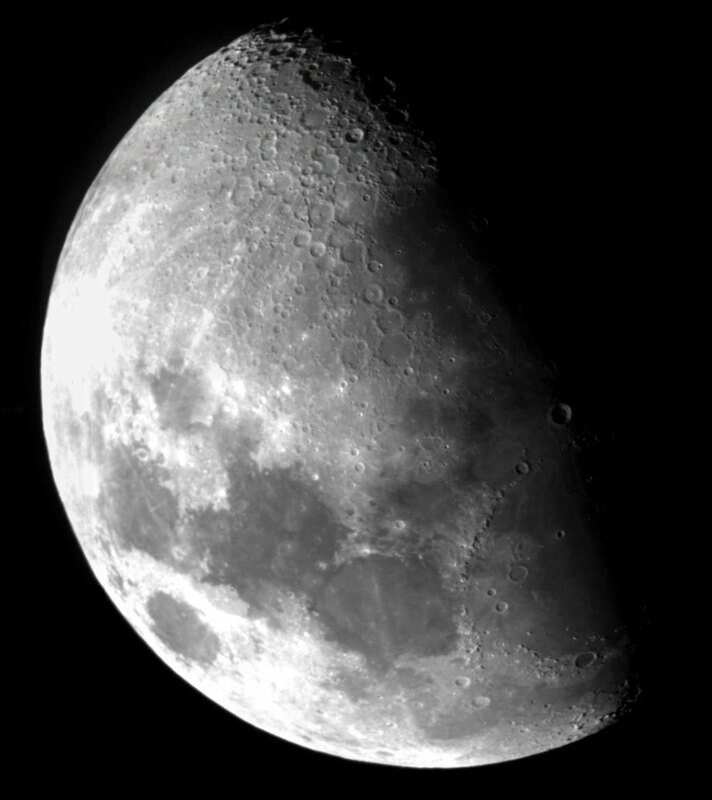 I attached the ASI120MC to the C-11 with a 3x Barlow and took three videos of 120 seconds duration and processed them in AS!2 keeping 30% of the best frames then Registax6 for sharpening. 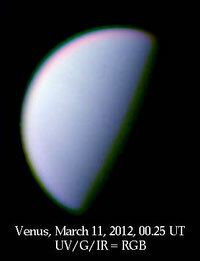 Result from the best video taken at 0310 UT is attached. Although quite fuzzy, a large amount of identifiable surface detail is present. Note clouds over Elysium Mons and the apparently permanent cloud bank over Hellas. I think it must be snowing dry ice there. April 25, 2014. Seeing was poor, abouit 3/10 but transparency was excellent. I took 8 videos of 120 sec duration with a shutter of only 5 ms. With a small ROI this gave me 183 fps and around 22,000 frames per video. I processed the videos in AS!2 keeping 50% of the frames and used Registax to adjust contrast and sharpen as much as was feasible. I then used GIMP to convert the 8 jpegs into an animated GIF. Although the resolution is poor because of the seeing, the contrast is nice and many albedo features are recognizable. 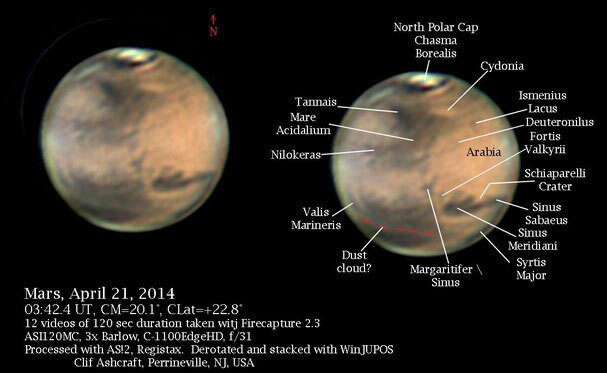 Note blue cloud over Syrtis Major, heavy clouds over Hellas, and the Lowellian "canals" Deuteronilus and Protonilus. April 21, 2014. 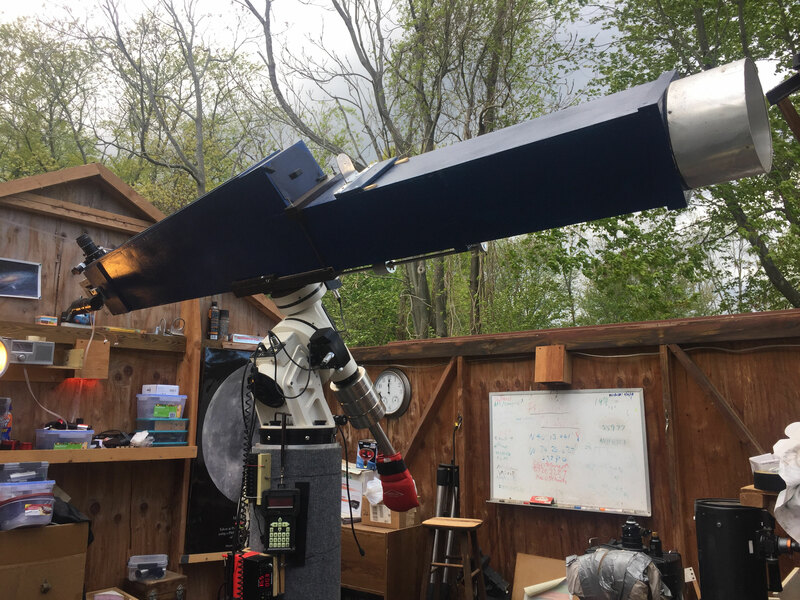 Seeing was average, 4-5/10 with good transparency when I took twelve videos of 120 seconds duration with the ASI120MC, 3x Barlow and the CPC-1100EdgeHD using Firecapture 2.3. 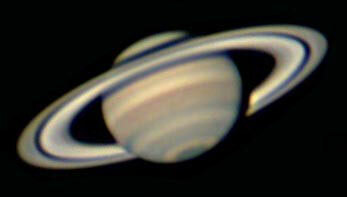 Videos were processed with AutoStakkert2, Registax6 and WinJUPOS to give the above derotated stack of images from all 12 videos. The connection between Sinus Sabaeus and Sinus Meridiani appears normal in this image. It is possible that it was never covered with dust, but simply obscured by a dust cloud, the crescent shaped beige streak in the 02:06.5 UT image from April 17. Note that there is another beige streak across Mare Erythraeum which looks like a dust cloud in tonights image. April 20, 2014. 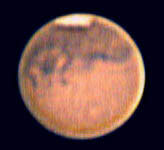 Seeing conditions were quite poor when I took the sequence of Mars images above only 1-2/10 seeing and 2/10 transparency. 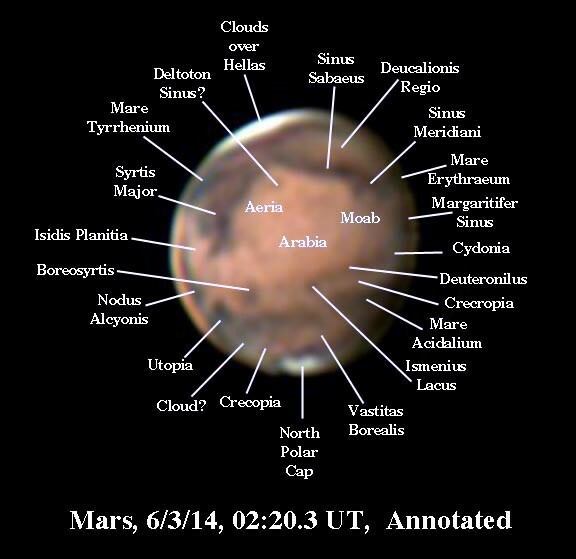 At times I could not even see Mars with the naked eye through the overcast. My goal was to replicate my findings of the 17th and 18th about the connection between Sinus Meridiani and Sinus Sabaeus being covered with light albedo material and no longer visible. 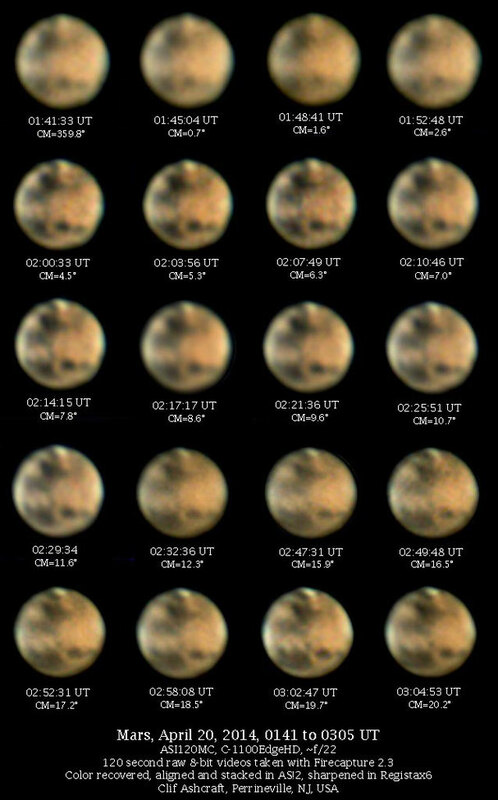 I deliberatedly started imaging earlier than usual to catch the features closer to the CM, but the altitude was still quite low and the earliest images are very blurred. The image taken at 02:00:33 UT seems to show a clear separation of the two, but later images suggest a connecting link. I will need a better night to settle this question. The ASI120MC and C-1100EdgeHD were used with Firecapture 2.3 to take the videos from which these images were prepared using Autostakkert and Registax6. April 17 and 18, 2014. Video for these two nights was taken with the ASI120MC on the C-1100EdgeHD and processed in AS!2/Registax/WinJUPOS. 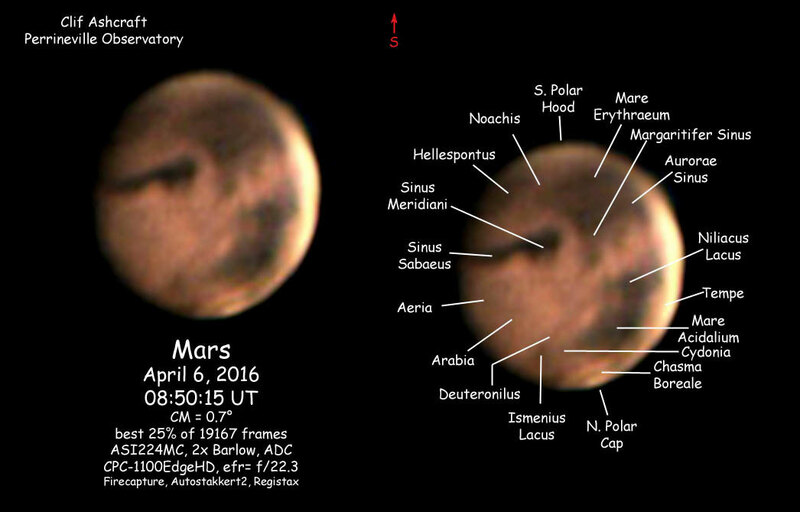 It is clear that something remarkable has happened since I last saw the Sinus Meridiani/Sinus Sabaeus region on March 19. There is a crescent shaped (as seen from the side) strip of high albedo material running from the Arabia/Eden region, south between the two sinuses, and further south into the low albedo regions of Noachis and Argyre south of Mare Erythraeum. 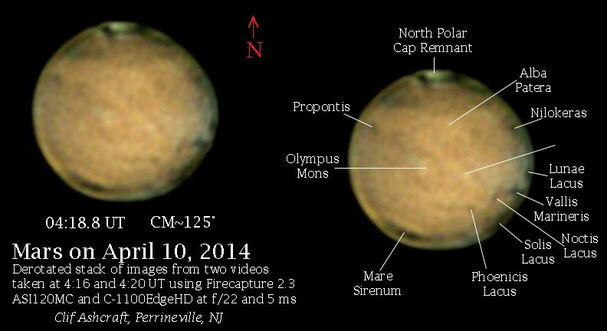 This is indicated in the annotated version of the 4/17/2014 02:06.5 image below as the curved red dotted line. The dark strip connecting Sinus Meridiani to Sinus Sabaeus is just gone. It appears to me that a sandstorm, either from Arabia to the north or Noachis to the south has blown light colored dust over the dark albedo feature. 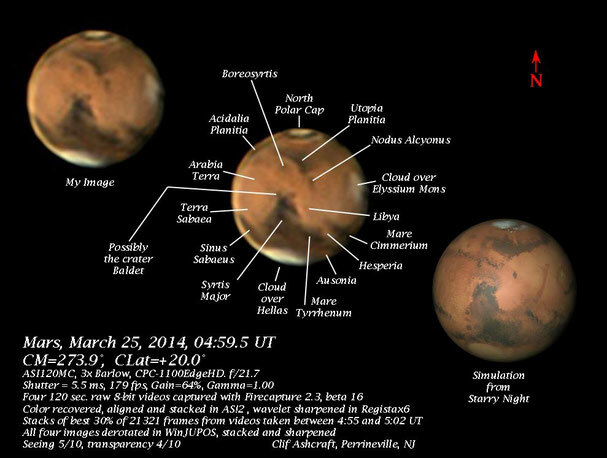 This is also shown in the image above from 4/18/2014, 02:45.1. Only the faintest trace of the formerly very dark connection between the two sinuses is visible. An image by Christophe Pellier taken on April 15, 23:41.0 UT clearly shows the dark albedo connection, so whatever happened took place between then and when I took my picture on April 17, 02:06.5 UT. April 6, 2014. 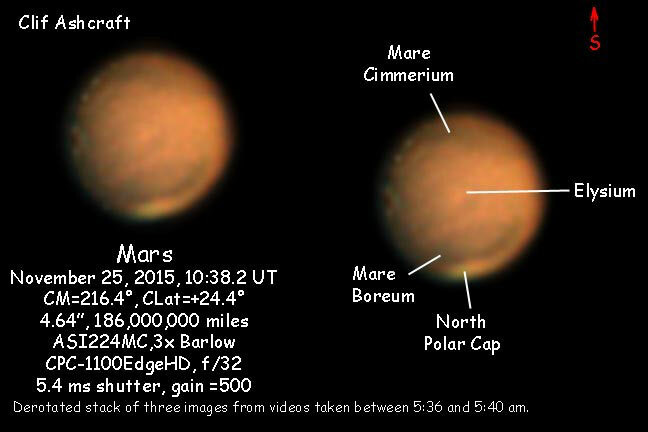 Seeing was only fair, but transparency was excelent when I took seven video of Mars with the ASI120MC camera and the C-1100EdgeHD. Using Firecapture 2.3, I was able to use 5 ms exposures thanks to the brightness of Mars and the sensitivity of the camera. Between this and the small ROI of only 224x224 pixels, the frame rate was around 195 fps and I got 25,000 frames in a 120 second video. I processed the videos in AS!2, keeping only the best 10% of the frames. 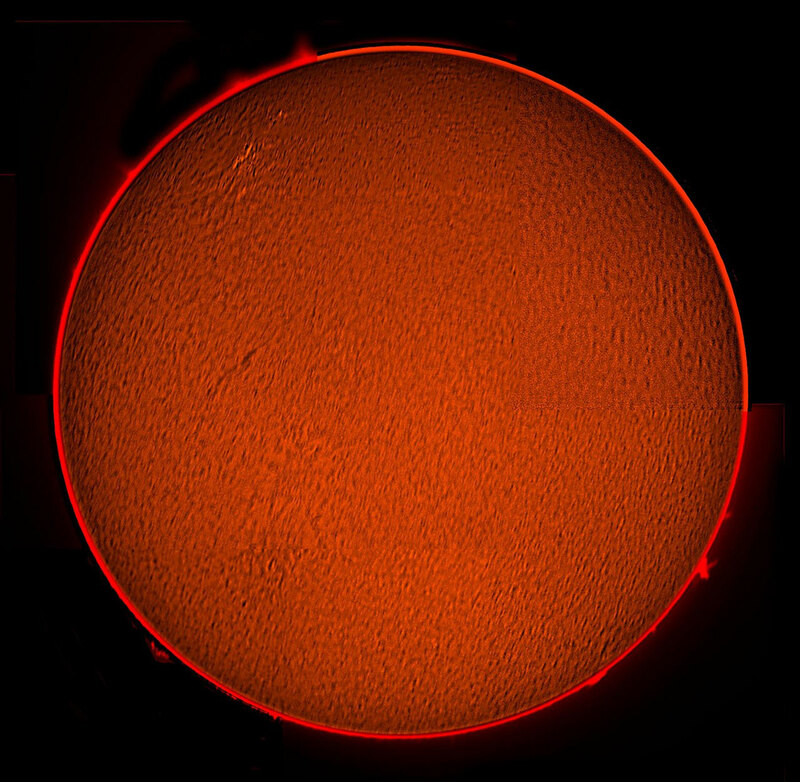 The resulting seven TIF files were derotated and stacked in WinJUPOS and finally sharpened with wavelets in Registax6. 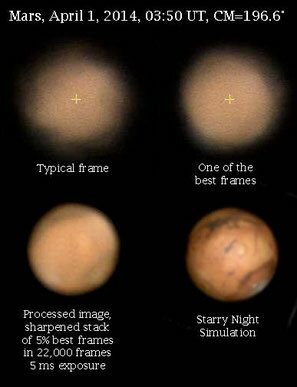 Note that the final image contains information distilled from the best 10% of 175,000 frames. 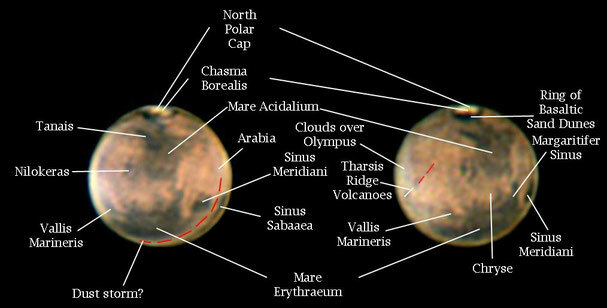 The volcano Elysium Mons is visible in this image, but not Olympus Mons which is covered with clouds as are the smaller volcanoes of the Tarsis Ridge. The North Polar Cap is very small and surrounded by a dark ring, perhaps the Chasma Borealis has melted all the way through. Either a patch of ice or a cloud lies south of the ring in the direction of Elysium Mons. April 1, 2014. Attached is the best I could do with Nature's great April Fools joke on me. 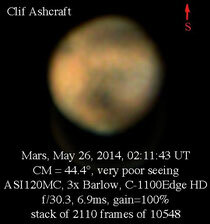 Mars was quite bright, allowing me to use only 5 ms exposures at the modest gain of 65% on the ASI120MC. Focal ratio was around f/22 on the C-11. Seeing was so horrible that I thought I must be looking through a column of turbulent air above someone's chimney, but it was equally horrible in all directions. 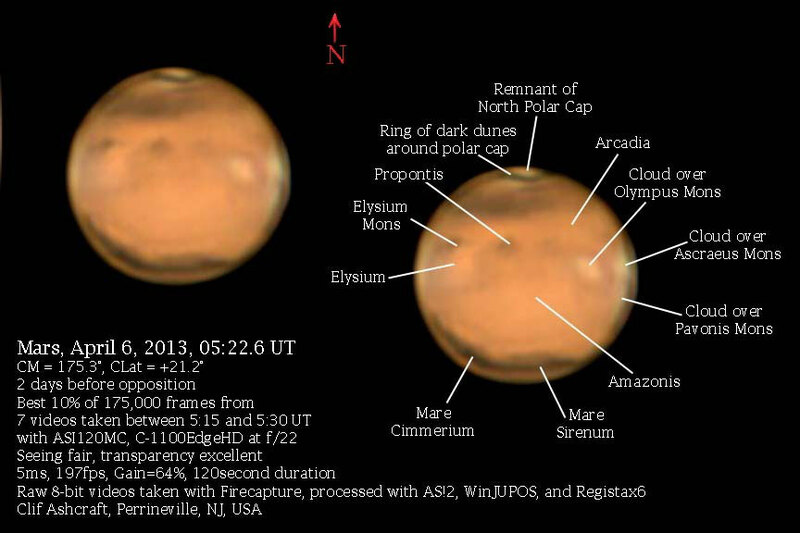 Mars was 38 degrees altitude at the time. I took only one raw 8-bit video of 120 seconds duration before giving up in disgust. I got 21,884 frames. 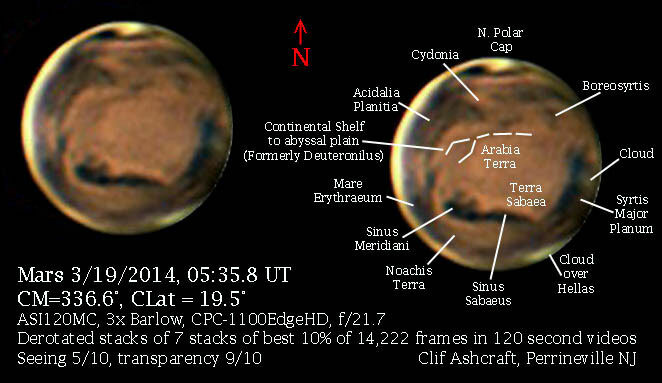 In some of them, Mars had been inflated like a fuzzy balloon nearly filling the 224x224 pixel ROI. The first image is a typical frame and the second is one of the best frames that I could find in the video. I aligned, dithered in the color info, sorted and stacked in AS!2 and then did what I could with wavelets in Registax6. 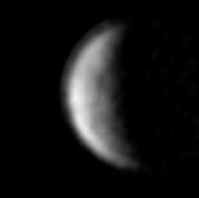 I was surprised to get anything from the effort, but some detail is visible in the image, including Mare Cimmerium, the North polar cap, the Elysium region (light spot slightly above and right of center), Utopia (dark area near polar cap) and what is probably a cloud over Olympus Mons (white spot, lower left on limb). March 19, 2014. 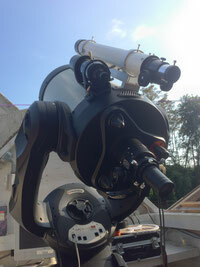 For my first imaging opportunity this apparition I got some good results. Seeing was average, transparency excellent and the air was very calm and frost was forming. There were intstants of better than usual seeing, however. 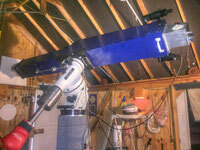 I set up the CPC-1100 with The ASI120MC camera mounted on the new dispersion compensator with a 3x Barlow on the front. I took 13 raw undebayered 8-bit videos of 120 seconds duration bewteen 5:20 and 5:36 UT. Exposure time was only 8.3 ms and I was getting frame rates of 118 FPS at 60% gain. Videos had over 14,000 frames each. I processed the videos in AS!2, using the 1x dithering procedure to recover the color information (no debayering used) and kept the best 10% if the 14,000 frames to align and stack. Results were sharpened in Registax6 and then the best seven of the results were derotated and stacked in WinJUPOS and finally sharpened again in Registax6. The result of all these operations is shown in the picture above. Note labeled features. We even see Lowell's Deuteronilus and Protonilus "canals", indicated by dashed lines. The actual albedo feature outlines the continental shelf between Arabia Terra and the north abyssal plain. Note cloud over Syrtis Major and over Hellas.